According to Hoetker and Agarwal (Academy of Management Journal, 50(2), 446–469, 2007), research on knowledge transfers related to business closures is scarce. This paper intends to fill the knowledge gap on the transition to entrepreneurship after a business closure. This paper studies which employees are most likely to start an entrepreneurial venture after being affected by a displacement. Furthermore, following, e.g., Hyttinen and Maliranta (Scandinavian Journal of Economics, 110(1), 1–21, 2008) and Sørensen (Administrative Science Quarterly, 52, 387–412, 2007), this study investigates the link between former workplace characteristics, such as the size and age of the former workplace, and the transition into entrepreneurship. In the second part of the analysis, the performance of the entrepreneurial ventures started by employees after displacement is explored as it relates to survival, employment, and profitability. The empirical setting employs an employer-employee-matched dataset coving all displaced employees in Sweden during 2001–2010. The empirical findings suggest that employees displaced from smaller firms are more likely to transition to entrepreneurship. Employing a Cox proportional hazard model to study the survival of these companies shows that new firms generated by displaced employees from small establishments are more viable. Furthermore, individuals who took part in labor market polices have a higher probability of becoming entrepreneurs, although these firms tend to show lower survival rates, which indicates that these transitions are necessity-based. As for the performance of the business, the empirical findings suggest modest growth in terms of employment, turnover, and operating profit for the vast majority of entrepreneurial ventures started after displacement. Job displacement, defined as “an involuntary loss of job due to economic downturns or structural change (OECD 2013, p. 192), affects millions of employees every year. According to a cross-country comparison by the OECD (2013), displacements affect 2–7% of employees every year. There is a rather substantial body of empirical literature on the people who are most commonly affected by displacements and the individual consequences of displacement in terms of unemployment duration and earnings losses, for example (see OECD 2013 for an overview of this literature). Consequently, the individual and societal cost of displacement is substantial due to the long unemployment periods and possibly deprecation of skills that may follow displacement. Business closures1 often receive considerable attention from the media and policymakers whenever they occur as large-scale closures. Among the largest bankruptcy filings in the US were those of Enron (2001), WorldCom (2002), Lehman Brothers (2008), and Washington Mutual (2008). What happens to employees after a business closure? According to the OCED (2013) study mentioned above, the re-employment rate of displaced workers varies substantially across countries. In France and Portugal, approximately 30% of displaced workers have a new job within 1 year, while the corresponding figure for Finland and Sweden is approximately 80%. However, as noted by Hoetker and Agarwal (2007), our knowledge of how knowledge and skills created at closed firms and possessed by displaced employees can be re-utilized and capitalized remains limited. Exceptions include Knott and Posen (2005), who find that firms that exit generate positive externalities, such as knowledge spillovers, which benefit others in the industry; Hoetker and Agarwal (2007) study the diffusion of knowledge in terms of patent citation from exiting firms and find that although firm exit is not fatal for knowledge diffusion, it does reduce it significantly. Nevertheless, there is a lack of systematic knowledge regarding knowledge transfer and the skills carried by employees following business closures. To the extent that studies on the labor mobility of displaced workers exist, they tend to be case-based.2 However, the previously mentioned cross-country comparison by the OECD (2013) and recent papers by Magnergård (2013); Nyström and Viklund Ros (2014) and Nyström, (2018), which explore the transition patterns of all displaced workers in Sweden, are contributions that systematically explore these transition patterns. However, these papers tend to focus on transition to employment, while studies on transitions to entrepreneurship after displacement are scarce. Exceptions are Magnergård (2013) who finds that within 1 year after displacement, approximately 2% of employees make the decision to become entrepreneurs and von Greiff (2009) who finds that displacement doubles the probability to become self-employed. Furthermore, Røed and Skogstrøm (2014) find displacement to increase the probability to become an entrepreneur substantially. However, none of these papers explore the performance of the companies started by displaced employees. The lack of knowledge regarding transitions to entrepreneurship after displacement is unfortunate since failed entrepreneurial firms can generate value that can be used by other entrepreneurs’, i.e., generate failure externalities (Acs et al. 2016). This paper intends to fill the knowledge gap on the transition to entrepreneurship after a business closure. The following research questions are investigated in this paper. Which employees are most likely to start an entrepreneurial venture after being affected by a displacement? Do the characteristics of their previous workplace (in terms of size, age, and performance of the business closed) influence the probability of transition into entrepreneurship? To what extent do displaced employees utilize their knowledge from previous employment when starting a venture in the same industry? Does experience measured by occupational status matter for the decision to become an entrepreneur after displacement? This study also analyzes the performance of entrepreneurial ventures started after displacement in terms of survival, turnover, employment, and profitability. Is an entrepreneurial venture started in the aftermath of displacement a temporary solution to joblessness, or do these ventures grow and become a persistent part of the economy, and, if so, to what extent? Which individual characteristics and characteristics of the business closure influence the survival of the venture? The empirical section of the paper uses a unique dataset of matched employer-employees that makes it possible to study the transition and performance of entrepreneurial ventures started by displaced employees in Sweden during the period 2001–2010. For the period 2000–2008, the OECD reports an average displacement rate of approximately 2% in Sweden. This implies that in Sweden, approximately 100,000 Swedish employees lose their jobs every year due to a business closure (Tillväxtanalys 2009).3 In the first part of the paper, the probability of becoming an entrepreneur after displacement is studied. The individual characteristics that are usually found to influence the choice to become an entrepreneur are controlled for. This includes, for instance, the experience of the entrepreneur measured by the occupational position at the entrepreneur’s previous place of employment and whether the displaced employee has been involved in labor market policy measures. One novelty of the paper is that the firm-individual level dataset enables an analysis of the extent to which the characteristics of the closing business influence the decision to become an entrepreneur after closure. This includes the age, size, and performance of the previous business (see, e.g., Hyttinen and Maliranta 2008; Sorensen 2007; Elvung 2016 for empirical studies on the size and age effect of previous employee on the transition to entrepreneurship). Furthermore, the performance of the entrepreneurial ventures created after displacement will be explored. This includes the survival, employment, turnover, and profitability of the entrepreneurial ventures started by displaced workers. In this part of the analysis, a Cox proportional Hazard model is employed to study the survival of the entrepreneurial ventures created by displaced employees. Again, individual and firm characteristics associated with the business closure are assumed to influence the survival of the business. This analysis helps us understand more about whether the decision to become an entrepreneur is necessity- or opportunity-driven. To formulate well-targeted labor market policies and improve the institutional support available in connection with displacements, further understanding the nature of labor market transition after displacements, including transitions into entrepreneurship, should be of great importance. The paper is organized as follows; section 2 discusses the theoretical arguments and previous empirical research regarding the individual characteristics and the characteristics of the closing business that may influence the transition to entrepreneurship. Section 3 describes the Swedish institutional context influencing the decision to become an entrepreneur after a person is affected by a business closure. Section 4 provides a description of the data the empirical strategy. The empirical results are discussed in section 5. Finally, conclusions and some suggestions for future research are provided in section 6. Labor mobility patterns after displacement may take several paths. Figure 1 displays the possible transition paths for employees affected by a firm closure. The individual can decide to enter a new position of employment in a new or incumbent firm, leave the labor market (for studies, unemployment, or other reasons) or become an entrepreneur. The empirical evidence regarding the individual characteristics that determine the transition of displaced workers into new employment or labor market exit has been extensively researched in the literature. This literature shows, for instance, that displaced workers tend to suffer from longer periods of unemployment and reduced earnings compared to non-displaced workers (see the previously mentioned summary by the OECD 2013 for an overview). Individuals who are older, women, and workers with less education, as well as workers with long previous tenure tend to suffer most from displacement (OECD 2013). Thus, previous research on displacement has focused on the individual characteristics in terms of age, gender, or education, for example. However, in this paper, I also want to explore whether characteristics of the closing establishment are important for the future transition of displaced employees into entrepreneurial activities. Empirical research regarding the individual characteristics that influence the decision to become an entrepreneur is now extensive. Parker (2009) summarizes the empirical evidence and concludes that the probability of becoming an entrepreneur increases with age because the potential entrepreneur, for example, acquires more experience and develops his or her social network. Furthermore, the empirical evidence shows that entrepreneurial activities tend to decrease when a person approaches retirement age. This possible non-linear relationship implies that an inverted U-shaped relationship between age and entrepreneurship is expected. To empirically test this relationship, a squared age variable can be introduced in the empirical analysis. Regarding the performance of the entrepreneurial venture, Parker (2009) concludes that most empirical studies find the age of the entrepreneur to be positively related to survival. Related to the discussion on the relationship between entrepreneurship and age is the issue of experience and the propensity for an employee to become an entrepreneur and for his or her subsequent performance as an entrepreneur. Shane (2003) distinguishes between general business experience, industry experience, functional experience (e.g., marketing, management), start-up experience, and vicarious experience (observing others being entrepreneurs). On this matter, previous empirical evidence shows that individuals with entrepreneurial experience and individuals with entrepreneurial aspirations are more likely to become entrepreneurs in the future (Hyytinen and Ilmakunnas 2007). According to Bhide (2000) and Dunkelberg et al. (1987), successful entrepreneurs and entrepreneurs who show higher than average growth rates commonly identify their business idea while still at their previous place of employment. Parker (2009) also concludes that the empirical evidence suggests that entrepreneurial experience and industry experience are positively related to the survival of the venture. However, most other variables measuring experience (including managerial experience) are not found to enhance survival chances. In this paper’s empirical analysis, there is also information on whether an individual has participated in any labor market policy measures, which indicates whether they have a history of unemployment. Regarding the transition from unemployment to entrepreneurship, Carrasco (1999) found that unemployed individuals have a higher probability of becoming self-employed compared to employees. It is also interesting to note that longer durations of unemployment are associated with a higher probability of transition into entrepreneurship (see, e.g., More and Mueller 2002). However, the performance of ventures started by the unemployed is less successful compared to employees who become entrepreneurs (Andersson and Wadensjö 2007). According to a literature review by Parker (2009), previous experience of unemployment does not promote survival and instead has a negative relationship with firm survival. Furthermore, the empirical evidence shows that women are less likely than men to become entrepreneurs (Parker 2009). According to the Global Entrepreneurship Monitor, the entrepreneurial activity among the Swedish male population is approximately 9%, while the corresponding figure for women is approximately 4% (Singer et al. 2015). The differences in goals and types of entrepreneurial ventures started by women and men also result in performance differences. Parker (2009) concludes that there is a gender entrepreneurship earnings gap and that female entrepreneurs underperform relative to men with regard to turnover, employment creation, and venture survival. For instance, Lohmann and Luber (2004) find that approximately 40% of women who are self-employed remain in business after 5 years, while the corresponding figure for men is approximately 60%. Education and income can be expected to be positively related to entrepreneurial activity. It can be argued that a certain amount of human capital is required to be involved in innovative and entrepreneurial activities. Furthermore, well-educated employees generally have jobs with more independence, which may imply that they have access to social networks required for entrepreneurial activities. Income is also an indicator of the individual ability of a potential entrepreneur. On the other hand, education and income are usually correlated, and thus the opportunity cost of entrepreneurship may be high. Even if the evidence is far from conclusive, according to Parker (2009), most empirical studies find a positive relationship between education level and transition to entrepreneurship. Regarding the performance of the entrepreneurial venture, survival rates are found to be positively related to an entrepreneur’s education level. Furthermore, it is suggested that immigrants have a higher propensity to become entrepreneurs. Numerous potential reasons for such an overrepresentation have been proposed (see Parker 2009). Some suggested reasons are that immigrants have access to ethnic capital that may be utilized in an entrepreneurial setting, that their mobility to paid employment is blocked due to language barriers, non-validated foreign qualifications, or even discrimination, or that immigrants are self-selected risk takers. Summarizing the empirical evidence, Parker (2009) concludes that there is a positive relationship between immigration as a determinant of entrepreneurship. Regarding the relationship between immigrant status and survival rates of entrepreneurial ventures, Parker (2009) concludes that there is either no relationship or a negative relationship, although the conclusion is derived based on a small number of studies. Finally, opportunities for entrepreneurial activities vary substantial across regions with entry rates being the highest in metropolitan regions (see Barreneche García 2014; Nyström 2007, 2009). Hence, the probability of transition into entrepreneurship can be expected to be higher in metropolitan regions. Hoetker and Agarwal (2007) argue that for a successful knowledge diffusion to take place, it is important for an entrepreneur to use an existing firm as a template to observe and perhaps interact with their rules and routines to fully benefit from knowledge spillovers. Hence, it can be argued that previous employment experience in the same industry should have a positive effect on the performance of the entrepreneurial venture created after displacement even if, in the case of business closure, the entrepreneur do not have possibilities to interact with the previous employer. Regarding the characteristics of the former workplace, the extent to which size and age of the establishment influence the transition to entrepreneurship has been researched. It has empirically been shown that employees in small firms are more prone to become entrepreneurs (e.g., Hyytinen and Maliranta, 2008). What explains this small firm effect on entrepreneurial spawning? According to Elfenbein et al. 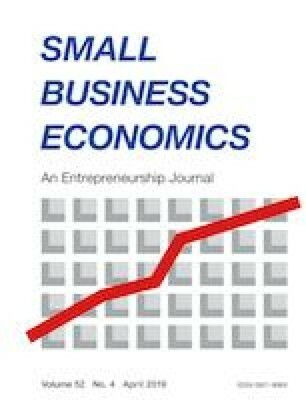 (2010), a selection effect may be prevalent because employment in small firms is similar to entrepreneurship. Hence, individuals who prefer independence and less bureaucracy and individuals who are less risk averse choose to work in small firms. Furthermore, the lower wages paid by small firms (see, e.g., Wagner 1997 and Waddoups 2007) imply that the employees are more likely to transit to entrepreneurship in order to increase their income. However, even if an alternative to staying in the firm does not exist in cases of business closure, it can be argued that the wage received at the closed business influences the income-related benefits received through unemployment insurance (see section 3.2). Hence, the wage at the closed business can still be argued to influence the opportunity cost of entrepreneurship. A final argument is that employment in small firms develops entrepreneurial learning and skills that could be valuable in pursuing an entrepreneurial career. As for the size of the establishment, it can also be hypothesized that a number of institutional factors may be of importance in the transition process following a business closure. These arguments are mainly valid when transitions to entrepreneurship are not primarily driven by the identification of opportunities that an employee would like to explore. For several reasons, it can be argued that employees at larger firms may have better chances of finding new employment. First, larger firms may be able to provide more support in the transition process in connection with a closure. Second, there may also be a positive signaling effect associated with previous employment at a large company. Small and new companies face a competitive disadvantage when recruiting relative to large and established firms because they are unable to rely on their reputation and name to attract applicants (Aldrich 1999). Attracting more applicants for a position implies that a company can select higher quality employees from the larger applicant pool (Turban and Cable 2003). Having this background in mind when recruiting displaced employees from a larger company implies the possibility that the employee selected for a large firm came from a larger pool of applicants, which should therefore signal high quality. Finally, employees in large firms are more likely to be covered by a collective agreement that ensures additional support in the transition process (see the discussion below on institutional support in case of firm closure). Even though new firms are often small, small firms are not always young. Nevertheless, some of the reasons discussed can be argued to be valid for young firms as well. There may be selection mechanisms at work, implying that less risk-averse individuals select into employment in new firms, as well as entrepreneurial learning and lower wages in new firms (Nyström and Elvung 2014) affecting the opportunity cost of entrepreneurship. It can also be argued that available institutional support increases with the age of the firm. However, labor mobility after working with a new firm is relatively less researched in the empirical literature (Nyström 2015). The empirical evidence on the new firm effect on entrepreneurial spawning is less extensive than on the small firm effect on entrepreneurial spawning. Nevertheless, Wagner (2004), Sørensen (2007), and Elvung (2016) find a firm age effect on entrepreneurial spawning. Regarding profitability, it can be argued that there is a higher probability of identifying profitable ideas worth exploring as an entrepreneur after a closure if the closed establishment was profitable. Many entrepreneurs discover the idea behind their entrepreneurial venture at their previous employer (Bhide 2000). In particular, the empirical evidence suggests that entrepreneurs who got their business ideas at their previous place of employment tend to perform better in terms of higher growth rates (Dunkelberg et al. 1987). In the case of business closure, it should be stressed that entrepreneurs who close a business still describe it as successful (Bates 2005); hence, there are possibilities to identify viable business opportunities, especially in businesses showing positive returns. In summary, firm size and age are hypothesized to be negatively related to transition to entrepreneurship while performance in terms of profitability is argued to be positively related to the probability of becoming an entrepreneur and to the performance of created ventures. The decision to become an entrepreneur naturally depends on the alternative options for income that are available after displacement. In this context, institutional conditions are of great importance. The two most relevant policies are the unemployment insurance system and the support offered by job security councils, which is a unique institution available in the Swedish context. Job security councils have developed as a part of the Swedish model, which implies that the parties on the labor market take responsibility for the readjustment process with respect to displacement. The support provided by job security councils is considered unique in an international context (Walter 2015). Job security councils are a complement to the unemployment insurance, and the support they offer is available for employees where firms have signed a collective agreement with a union. The funds were established in the period 1972–2012, and the number of employees covered by the funds has accordingly been increasing. Today, more than 3 million employees, i.e., most Swedish employees, are covered by this potential additional support in the case of displacement. There are currently ten organizations connected to the job security councils, and the goal, organization, and extent of the support offered differ (Walter 2015). Some of the job security councils offer additional economic compensation, but for the most part, they provide, for instance, information and coaching on how to find a new job. Annually, approximately 40,000 employees receive some type of support from job security councils (Walter 2015). The largest job security council in the private sector reports that approximately 2% of the employees involved in their support activities end up as self-employed. This is similar to the figure reported by Magnergård (2013). Interestingly, they also find that almost 80% of them perceive that their new job is either more or equally qualifying compared to the job they lost (TSL 2015). However, it should be mentioned that the access to the support offered by the job security councils are connected to the employer having a collective bargaining agreement. According to Företagarna (2011), 60% of the Swedish firms do not have such an agreement and small firms and firms in new and fast-growing industries are overrepresented among firms without collective agreement. What are the implications of the prevalence of the abovementioned benefits and institutions with regard to the incentives to become an entrepreneur? A reasonable conclusion is to assume that before the 300 days covered by the income-related unemployment benefits, the incentives to embark on an insecure path such as entrepreneurship would be relatively low (given that one qualifies for the income-related unemployment benefit). Hence, necessity-based entrepreneurial activities can be assumed to be rather low during this period. However, as the end of the unemployment insurance period approaches, the opportunity cost decreases and it is reasonable to assume that necessity-based entrepreneurial activities increase. However, it should be noted that before 2000, it was possible to qualify for an additional period of unemployment insurance. In 2000, a labor market policy aimed at stimulating unemployed workers to intensify their job-seeking activities was introduced, thereby removing the possibility of qualifying for such additional periods of unemployment insurance and reducing compensation levels. The dummy variable equals 1 if the individual is male and 0 if female. Work related income at the closed establishment (total gross salary including other income (e.g., sickness benefit, sick pay) (SEK). Participating in labor market policy (either education or receiving benefits prior to start-up). The dummy variable equals 1 if involved in labor market policy and is 0 otherwise. The dummy variable equals 1 if the entrepreneur is located in one of the three metropolitan regions Stockholm, Gothenburg, or Malmö and is 0 otherwise. The dummy variable equals 1 if the entrepreneurial venture is started in the same 2-digit SIC industry as the person was employed in and is 0 otherwise. aAs noted by, for instance, Minniti et al. (2008), although entrepreneurship and self-employment are not necessarily synonymous, self-employment is often used as proxy for entrepreneurship. bAccording to the Swedish Standard Classification Occupations 1996 (SSYK-code). The reference group is “Other occupations” with SSYK codes 5–9 and 0. Examples of occupations occupations are: engineers, technicians and nurses. Examples of specialized occupations are (with demand theoretical specialist competence): architects, business administrators, and lawyers Examples of managerial occupations are: management positions in large, middle sized and small companies. Examples of office occupations are: office work and customer service. The empirical analysis consists of two parts. In the first part, the determinants of the choice to become an entrepreneur after displacement are investigated. Because the dependent variable in this analysis has a binary outcome (becoming an entrepreneur or not), a logit-model is estimated. The estimation is corrected for heteroscedasticity by using robust standard errors. Odd-ratios are calculated to enable the interpretation of the size of the effects.15 An odds ratio exceeding one should be interpreted as the variable having a positive effect on the probability of becoming an entrepreneur, while an odds ratio below one indicates a negative relationship. For the analysis of performance of the entrepreneurial ventures, the development of turnover, employment, and the survival is analyzed. In line with previous research on firm survival (see, e.g., Mata and Portugal 1994; Esteve-Pérez and Mañez-Castillejo 2008; and Box 2008), the Cox proportional hazards model is applied. The Cox (1972) proportional hazards model is a semi-parametric estimation method where the covariates are multiplicatively related to the hazard, in this case, the closure of the firm. An estimated hazard ratio below one should be interpreted as the covariates having a negative effect on the probability of hazard (closure of the firm), while a hazard ratio above one implies a positive relationship. Figure 2 shows the development of the entrepreneurial activities by employees who are affected by a business closure. It is interesting to note that the prevalence of these entrepreneurial activities has increased over the period. During the period 2001–2007, the share of displaced employees who transition into entrepreneurial activities increased from approximately 2.5 to 4%. This can be compared to the prevalence of entrepreneurial activity measured by the Global Entrepreneurship Monitor, where total entrepreneurial activity (TEA) was quite stable at approximately 4% during the same period. After 2007, TEA rates increased to approximately 8% in 2013 (Braunerhjelm et al. 2015) and at the same time, the entrepreneurial activities by displaced workers increased. It is possible that the previously mentioned stricter regulation regarding the policy on what happens after the 300 days covered by unemployment insurance, which was introduced in 2000, can explain part of the somewhat upward trend during 2001–2007. If these stricter policies influence the incentives for transition to entrepreneurship, it can be argued that they most likely would generate necessity-based entrepreneurship. However, the development of necessity-based entrepreneurship reported by the Global Entrepreneurship Monitor for this period does not provide any clear pattern that would support this argument (Braunerhjelm et al. 2015). Table 3 presents the results from the logit-model estimating the probability of a displaced employee becoming an entrepreneur. In the analysis, the probability of entering entrepreneurship 1, 2, or 3 years after displacement is reported. The purpose of this distinction is to explore whether the transition patterns differ over time assuming that the prevalence of necessity-driven entrepreneurship increases the longer the time passes since the business closure. As expected and consistent with previous empirical research (e.g., Hyytinen and Maliranta 2008), working for a large establishment decreases the probability of transition into entrepreneurship. In line with our previous expectations, the performance of the prior establishment turns out to be statistically significant, with odds ratios being slightly above one during the first year. However, the odds ratio is below one during the second and third year after closure. Hence, if the transition to entrepreneurship is immediate, it is more likely that the transition is based on identifying a profitable opportunity at the closing business. Regarding the age of the closure, the probability of transition to entrepreneurship has an odds ratio that exceeds one during the first year. Hence, the idea that employees in younger firms closing down are more likely to become entrepreneurs is not supported. For the second and third year, the odds ratio is below one, but the size of the firm age-effect is very small during all 3 years. Regarding individual characteristics, similar to the general evidence on the decisions to become entrepreneurs, males have a higher probability of becoming entrepreneurs. This finding is valid for all 3 years after displacement. Also in line with previous empirical research, the transition into entrepreneurship increases with age but with a decreasing rate (squared age). Individuals who have entrepreneurial experience have a higher probability of transition into entrepreneurship. However, it should be noted that for the first year of observation, the size of the effect is overestimated due to a methodological problem related to the fact that it is only possible to observe the transition into entrepreneurship on a yearly basis.16Furthermore, as expected, employees in metropolitan regions are more likely to become entrepreneurs after displacement. Individuals with qualified, specialist and in particular, managerial occupations have a higher probability of becoming entrepreneurs. Finally, an interesting finding is that individuals who have participated in labor market policy measures (either education or income-related unemployment benefits) also have a higher probability of transition into entrepreneurship after displacement. Figures 3, 4, 5 and show the average development of employees, turnover, and operating profit for the firms started the year after displacement and that survive at least 5 years. The employment development of these firms seems rather moderate in that they start by employing approximately 2.5 employees on average, which increases to approximately 3.2 employees after 5 years. The average turnover at the beginning of the period is 12,800 SEK, increasing to 15,800 SEK after 5 years. For operating profit, the average profit is 800 SEK in the beginning of the period and increases to 1100 SEK after 5 years. These are all quite moderate performance figures. However, looking at the distribution of performance (provided in Appendix 2) some of these entrepreneurial ventures turn out to be successful in terms of performance. The maximum values for these firms are 7.5 million SEK in turnover, 725,000 SEK in terms of operating profit and 313 employees. Table 4 provides the results of the Cox proportional hazard model studying the survival of the firms generated by displaced employees. Regarding the characteristics of the closing establishment, the results show that coming from a large closure increases hazard rates, i.e., entrepreneurial ventures started by displaced workers in small firms have higher chances of survival. Thus, this result supports the idea that firms generated by displaced employees in small firms are more viable because the employees of these firms may have acquired valuable entrepreneurial knowledge during their time as employees in small and new firms. Entrepreneurship spurred from older firms has lower hazard ratios, but the size of the effect is rather small. Furthermore, entrepreneurial activity spurred from profitable firms reduces hazard ratios, which supports the hypothesis that these displaced employees may have identified a profitable business idea at their previous place of employment. As expected, entrepreneurial ventures started in the same industry as the entrepreneur was working before reduces the hazard rate indicating that starting a business in the same industry generates business ideas with higher chances of survival. Regarding the individual characteristics, the empirical findings are in line with previous empirical research (Parker 2009) and suggest that the hazard rate is lower for male and older entrepreneurs. A higher wage at the closed establishment also decreases hazard rates. Thus, it is argued that a higher wage at the prior place of employment implies that the potential benefits from entrepreneurship are estimated to be rather high (more likely opportunity-based entrepreneurship), which should enhance the probability of survival. Furthermore, consistent with previous empirical findings on venture survival, entrepreneurs with foreign backgrounds have a higher hazard ratio. However, firms started by individuals with higher education surprisingly show lower survival. Being involved in labor market policies in immediate relation to the firm closure increases hazard rates of the entrepreneurial venture started. This is consistent with the findings by Andersson and Wadensjö (2007) who find that unemployed individuals perform worse than employees starting an entrepreneurial venture. Somewhat surprisingly the effect of entrepreneurial experience does not turn out statistically significant in the empirical analysis. Among the occupational categories, having an office occupation, managerial experience and qualified occupation increase hazard ratios. This is also somewhat surprising because previous research according to Parker (2009) indicates that most types of experience are weakly related to firm survival. Hence, it is possible that these findings imply that experience plays a different role for survival of the ventures when the venture is created by displaced workers. For instance, when individuals with a more qualified occupational background engage in entrepreneurial activities in the aftermath of the displacement, it is potentially a temporary solution to joblessness waiting for a more attractive opportunity to appear. Finally, entrepreneurial activities initiated by entrepreneurs in metropolitan regions have hazard ratios exceeding one reflecting the higher turbulence in terms of entry and exit rates in these regions (Nyström 2007, 2009). Appendix 3 provides the Kaplan-Meier survival estimates which indicate that approximately 80% of the ventures survive their first year while approximately 40% survive 4 years. This paper contributes to the literature on the future utilization and capitalization of knowledge and skills of employees when their former employees decide to close a business. In particular, the decision to become an entrepreneur and the performance of the entrepreneurial ventures started by displaced workers is explored. Table 5 summarizes the theoretical expectations and empirical findings in this paper. Among the individual characteristics associated with transition into entrepreneurship after displacement, individuals with qualified, specialist and, in particular, managerial occupations have a higher probability of becoming entrepreneurs. However, the analysis of the performance of these ventures in terms of survival shows that these ventures have a shorter survival period. This may indicate that the transition to entrepreneurship for these employees is a temporary solution to joblessness. Furthermore, individuals who have participated in labor market policy measures (either education or income-related unemployment benefits) also have higher probability of transition into entrepreneurship after displacement. The fact that these entrepreneurial ventures have lower survival may indicate that entrepreneurship is a temporary solution but also consistent with previous research that these ventures tend to perform worse (see, e.g., Andersson and Wadensjö, 2007). Regarding the link between the characteristics of the closing establishment theoretical arguments, suggested by Elfenbein et al. (2010), for why selection effects, opportunity cost effects, and learning effects are arguments that should imply a higher propensity of employees in small and new firms to transition into entrepreneurship. In addition, signaling effects and the institutional setting regarding the support provided by the former employee and the employment security fund, which are specific to the Swedish setting, can be argued to enhance the transition of employees in large firms to a new employment, leaving employees in small and new firms more exposed to necessity-based entrepreneurship after displacement. The empirical result supports the hypothesis that small business closures spur entrepreneurial activity after displacement. However, there is no empirical support for an age-effect on the probability of transition into entrepreneurship. Furthermore, firms generated by displaced employees in small firms turn out to have better prospects of survival, indicating that there may be a learning effect associated with working for a small firm. This paper uses register data where there is no available information about the motivation to start entrepreneurial ventures. Hence, it would be interesting to collect data on whether these entrepreneurial ventures created by displaced employees are perceived as necessity- or opportunity-driven. Furthermore, in the research setting of this paper, it is not possible to specifically distinguish between the role of selection, opportunity cost, and learning effects and the role of the institutional setting for the transition and patterns of displaced workers. In fact, to the best of my knowledge, there is little systematic research on the effect of the institutional support available in the case of business closure, at small and young firms and the transition to new employment or entrepreneurship after displacement. Furthermore, it would be interesting to explore the business idea generation process in relation to the information about the closure of the business. Does the entrepreneurial venture rely on a business idea that existed for quite some time while a person is an employee and is its realization spurred by information about an impending closure? What knowledge and skills developed at their former employment do displaced employees find valuable in their role as entrepreneurs? In this paper, the term “business closure” is used. A business closure may include bankruptcies or closures due to low profitability. However, it should be emphasized that a business closure should not always be regarded as a failure. There may be many reasons as to why owners decide to discontinue their business. For instance, the reason for closure may be that the entrepreneur wants to pursue other opportunities or end their entrepreneurial careers before retirement (see, e.g., Gimeno et al. 1997; DeTienne et al. 2008). See Nyström and Viklund Ros (2014) for a survey of the literature. Some large-scale closures that have received considerable policy interest in Sweden include the closure of an Ericsson plant in Norrköping in 1999 (telecom industry), SAAB in Trollhättan in 2011 (automobile industry) and AstraZeneca research facilities in Lund and Södertälje in 2010 and 2012 (pharmaceutical industry). Regarding the transition to entrepreneurship, it can be noted that when the pharmaceutical company AstraZeneca decided to close R&D facilities in Södertälje (located in the Stockholm region) in 2012, it affected more than 1000 employees. After the closure, 32 companies were started in various sectors (Life Science Sweden 2013). In the case of former employees of AstraZeneca becoming entrepreneurs, we find entrepreneurial ventures created with a clear connection to their employment in their previous industry. This includes ventures in sectors such as contract research, chemistry, and consultancy related to the industry. Among the companies created after closure ventures with a more remote connection to the pharmaceutical industry were also created. This includes businesses in investment, stock trading, and dog grooming, for example. For individuals with children under the age of 18, the benefits can be received for 450 days. It should also be noted that the conditions for unemployment insurance differ across the years studied in this paper. This concerns, for instance, what happens after the 300 days of unemployment insurance ends. Before 2000, for example, one could qualify for an additional period of unemployment insurance. In 2000, a labor market policy aimed at stimulating unemployed workers to intensify their job seeking activities was introduced, thereby removing the possibility of qualifying for additional periods of unemployment insurance and reducing compensation levels. This working requirement requires that the individual to have worked at least 80 h per month for at least 6 months during the last 12 months before unemployment. Combining statistics from SCB on employment and the number of members in unemployment funds from IAF (2015) for 2006 indicate that 87% of employed individuals are members. An additional institutional aspect relevant for this discussion is the government wage guarantee which implies that if a firm files for bankruptcy, the employee is guaranteed a maximum of 3 three monthly salaries. The process is defined as 3 years long if the number of employees at the firm 3 years prior to the closure was 50 employees or more and if the workforce was reduced by at least 20% each year during the closure process. The closure process is 2 years if it does not fulfill the requirements of a 3-year closure process and if the number of employees, 2 years prior to the closure, was at least 25, and if there was a reduction of the workforce by at least ten employees, corresponding to at least a reduction of 20%, the year before the closure. The closure process is defined to be 1 year, which simply corresponds to all of the establishments that are not defined to have 2- or 3-year processes. This definition applies to approximately 80% of closures. Because the data end in 2010 and a flexible window for defining closures with a maximum of 3 years is used, the implication is that the number of displacements is truncated in the end of the period. However, it is argued that the truncation will have less influence on the re-employment rates because these rates are calculated as a share of the number of displaced workers. An alternative would be to exclude these last years, but this would imply lost observations. A correlation table is available in Appendix 1. According to Tillväxtaanlys (2009), about 50,000 firms closed during the period 2001–2006, while the number of bankruptcies is approximately 7000–8000 for the same period. In STATA, the logistic regression option reporting odds ratios are used. In this model, xj is defined as the vector of independent variables, augmented by 1, and b the corresponding estimated parameter vector. The logistic regression model is fit by a logit estimation and the odds ratio corresponding to the ith coefficient is ψ i = exp(bi). This estimation supports the Huber/White/sandwich estimator of variance for the robust standard error option. For further details, see, e.g., STATA [R] base reference guide on logistic regression. If, for instance, the firm was closed during the beginning of the year, the individual affected by the closure may have already started his/her company the same year. When we observe the transition to entrepreneurship in the year after the business closure, the entrepreneurial experience may refer to the new venture induced by the business closure. The author would like to thank Ingrid Viklund Ros and Vardan Hovsepyan for their valuable assistance with working with the dataset. The author would also like to thank the participants at the workshop on “Bankruptcy institutions, corporate insolvency and entrepreneurship” in Turin 2015 and Paris 2016 for valuable comments and suggestions on previous versions of this paper. Braunerhjelm, P., Holmquist, C. Thulin P. & Silver. L. (2015). Entreprenörskap i Sverige- Nationell Rapport 2015, Entreprenörskapsforum, www.entreprenorskapsforum.se/wp-content/uploads/2015/06/GEM_Nationell_Rapport_2015_webb.pdf Retrieved 2016–02-24. IAF (2015) Statistics/Membership in unemployment funds November http://externastat.iaf.se/report.aspx?ID=112 Retrieved 2015–11-27. Life Science Sweden (2013) Bolagen efter Astrazenecas nedläggningar–hela listan http://www.lifesciencesweden.se/biotech/bolagen-efter-astrazenecas-nedlaggningar-hela-listan/ Retrieved 2015–11-27. Swedish Public Employment Service, (2015). Financial support for jobseekers, https://www.arbetsformedlingen.se/For-arbetssokande/Stod-och-service/Ersattning-fran-a-kassa.html Retrieved, 2015-11–17. TSL, (2015). Vart går deltagarna? TSL-rapport juli 2015:8, Trygghetsfonden TSL http://www.tsl.se/globalassets/rapporter/rapporter-2015/tsl-rapport-juli-2015.pdf Retrieved 2015–11-27.